WordPress themes. How to choose the right theme for your WordPress blog? 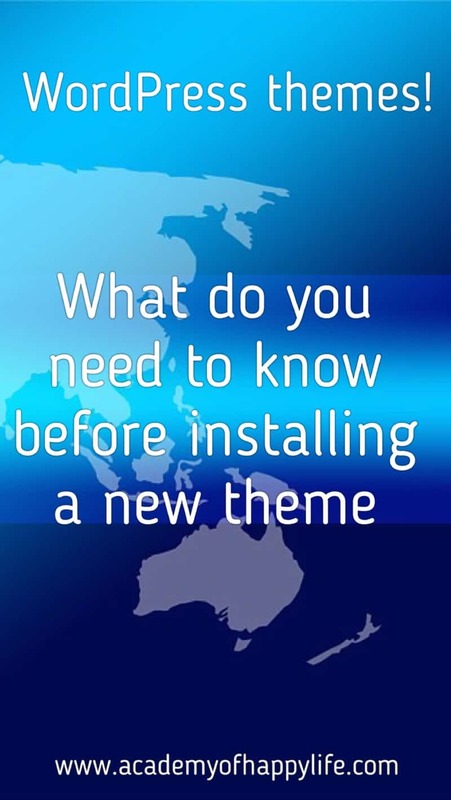 What do you need to know before buying a theme? This post contains affiliate links. I want you to know, I recommend just those services I use on my blog and believe will be very useful and helpful for yours too. 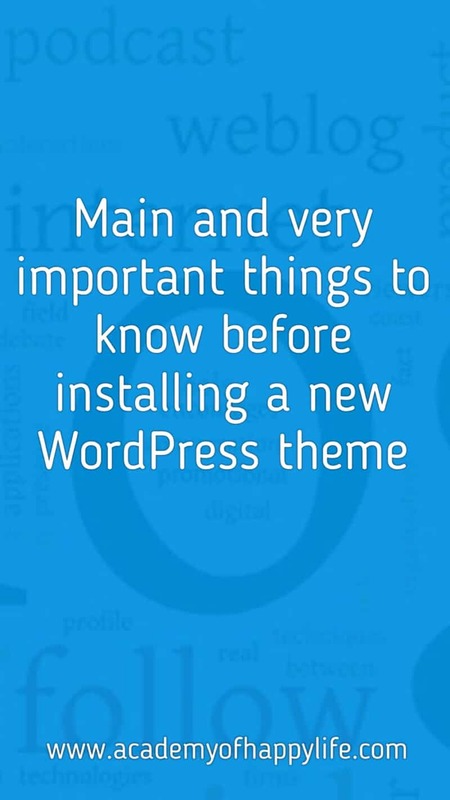 If you have a blog/website built on WordPress platform, you should be familiar with the term “theme”. If you are just thinking about having your blog – you will become familiar with it soon. A WordPress (WP) theme is a kind of template prebuilt for you, and which helps you design and set up your website’s layout. 4. Plugins to improve your blog. After you bought your domain and hosting, you need to design your blog. The best and the easiest way to do it is to install some theme. A theme is a specially coded template which you can customize in your own way without using any coding language. Actually, everything was already coded for you by theme developers, you just edit your colors, logo, favicon, and anything you need and want to customize. The difference between themes is the quality of coding and the number of things you can add to your blog from your ready templates. The majority of bloggers, especially beginners, usually just check the Demo site of the theme. If they like it, they install it on their blogs. But what is happening behind the scenes of your blog? People who are quite knowledgeable about themes and blogs will tell you that some new themes can totally mess up your blog. Everything depends on how that theme is coded. How can you know it? How can you know about the quality of a certain theme’s coding? and WHY do you need to know? The answers to these questions are very simple – if a theme is poorly coded, your blog will have very low IT characteristics. Which can automatically cause a low loading speed of your website. How to easily check your IT characteristics and why it is very important for your blog too: you can read here. Usually, the difference between a poorly coded theme and a good quality of coding theme is the price. Logically, if developers spent a lot of time to create a theme and they did a good job. They would like to make money out of it. But it does not work this way every time. There are still a lot of great themes which are awesome, with a lot of amazing functions and easy customizing tools, and they are totally for free. Very important – your theme is something virtual, downloaded from the Internet, which means it can and may contain some malware or viruses. How to scan and clean your blog for viruses and malware: read here. To protect yourself from those unexpected surprises, download your free theme from the WP library. You can find it in “Appearance”, then choose “Theme” section and there will be “Add New Theme”. If you choose from those themes, they are checked by WP professionals for viruses and malware and they are totally clean. It is a quite big collection, you can find more than 1,500 different themes. Again, those themes are clean of viruses, but nobody guarantees that they are coded very professionally. 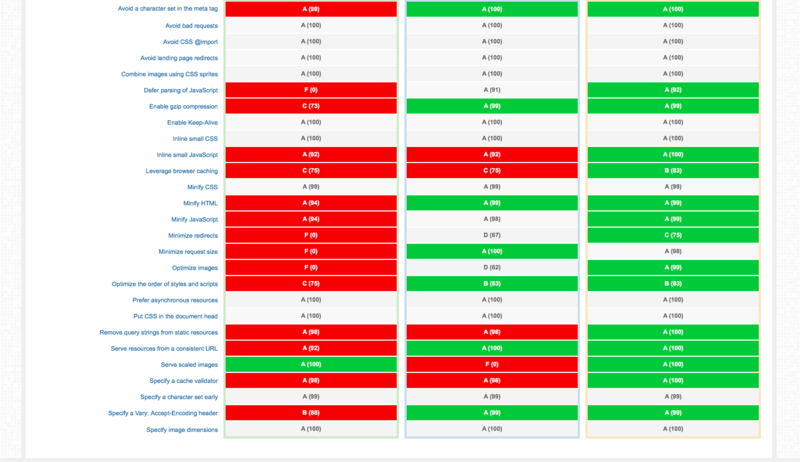 If you use a search engine for “best themes”, or “best-coded themes”, you will find a lot of different options to choose from, but who knows if they are good. But the best way is to check them by yourself to find out if they are really the best. What do I recommend doing? As I mentioned before, I am using SiteGround hosting. Actually, if you want to sign up to SiteGround through my special link, you will be able to have 60% off the original price for 3 years. My hosting company allows me to create as many subdomains as I need. With their help, I created a subdomain for my blog, which I called “test”, I copied all my main blog content there and I was trying different very popular themes there. I wanted to test different themes and to show you in this simple example below how much depends on the theme and how a simple theme change can mess up a lot of things on your blog. And I also wanted to see if those super recommended themes are really so great for my blog. Please note that this is the same website, the same plugins are installed, the same amount of information, the same hosting, everything is the same – the difference is just the theme. On this example, you can see how one theme can mess up everything on your website. Even the speed of your website can depend on the theme. 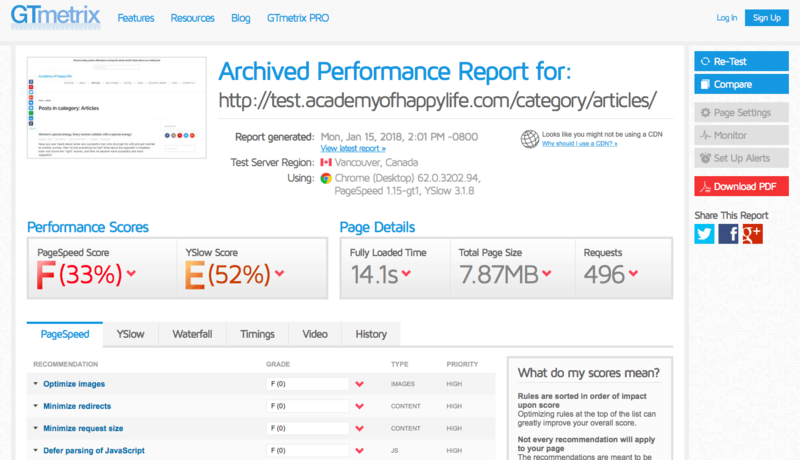 The worst scores and loading speed on my website, when I downloaded the Phlox theme. Check the photo below. How do I recommend choosing the theme? If it is a free theme and you trust the source from where you downloaded it in case it is not from the WP library, then create some subdomain and test it there. 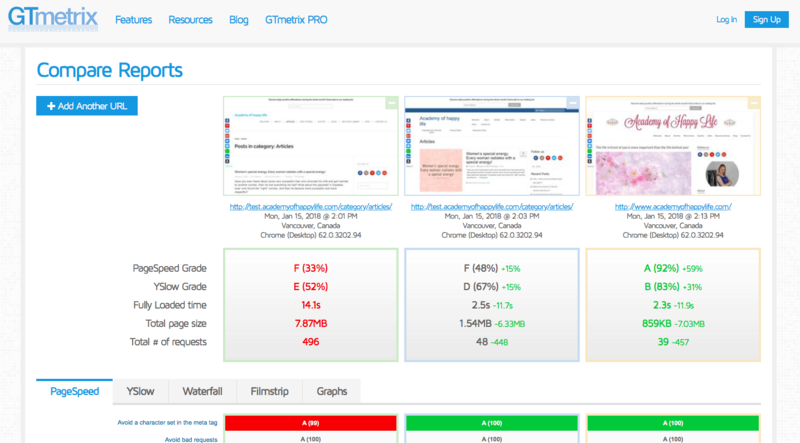 If it is a paid theme, scan their Demo site with GTmetrix.com and you will have more or less some information on what to expect. Actually, a lot of paid themes offer money refund if you are not satisfied with their quality. I would go with them. There are some companies that offer you the option to pay some monthly amount and use their theme. But in that case, you need to pay continuously when you are using their theme. As for me, better to pay once and forget about it. Very important note – be sure that if you decided to buy some theme, you will be able to update it for free whenever there will be a new update available. I came across some themes which were sold for 100$, and if you want to download a newer update, they would charge you an extra 95$. As I mentioned before, you should know if you will be able to download newer versions for free. If you don’t like that theme on your blog, or it is too complicated to customize, be sure that you have the option to get your money refunded. Usually, companies give 1 week, 2 weeks or 1-month money-back guaranteed. 3. Customers support from developers. It is very important, especially if you are still a beginner. Sometimes you check their Demo website and you just love how it looks and how it works, but when you download that theme to your own website, everything looks messed up and you have a lot of troubles to make it look normal. Some companies are offering just an email support. In that case, be careful where these developers are located. When I was a new blogger, I had an experience with buying one theme which I couldn’t customize properly, as it was too complicated. There were so many options and so many prebuilt sections which looked so nice in the Demo, but they were totally different on my website. Developers had just an email customer’s support, but the problem was that they were located in India, and I’m in Canada. So, I was writing them in the daytime and they were replying at night. The answers were not clear at all, so I had to ask even more questions than before and wait until the next day to receive some email back. Bottom line, the email communication didn’t give me any good results and I simply returned that theme and got refunded. I am sure that the email support is very good, but make sure that your developers live at least around the same time zone as you. Of course, the best is to have a phone or chat support, but this is not easy to find. Check their Demo site before downloading that theme to your website. I recommend checking it with GTmetrix. Usually, the developers make their Demo site look really good to show the best of their theme. If the Demo website is poorly coded, I am sure that the main theme will have the same results too. Actually, these are the main things you should know before changing your theme or choosing a new one. It is good to give some fresh look to your blog and to redesign it from time to time. Some people use the same theme continuously all the time, and some other people change it every 2-3 years. I know one woman who likes to change the theme every 6 months. It is very personal and it takes some time to customize it. Just be careful when you want to change your theme. My hosting provides me with a daily backup service, if yours does too, that’s great. If you did something wrong and you would like to go back to that time when everything was ok, you can restore your blog from a previous backup and have it working good again the same way it was. Usually, before changing my theme, I just call my hosting company and double check when was my last backup. Just in case, it is much better to be sure that I will be able to restore from a recent backup. Good luck! If you have some questions for me, feel free to ask them in the comments section below. ← Joke – updated Facebook status!